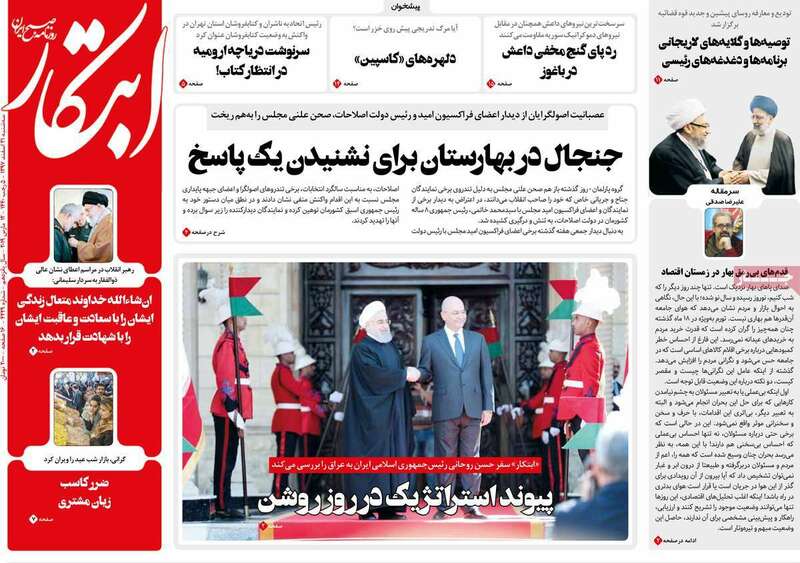 On March 11, President Hassan Rouhani arrived in Iraq for a three-day visit. It was his first official visit to Iran’s western neighbor. Iran and Iraq are Shiite-majority countries that share centuries-deep cultural and religious ties — and a 900-mile border. The Islamic Republic has used these advantages to permeate Iraq’s political, security, economic, and religious spheres. Rouhani’s meetings with top political, military, community, and religious leaders clearly signaled that Iran’s relationship with Iraq will remain strong despite U.S. concerns. Iran is seeking to expand trade with Iraq to help offset reimposed U.S. sanctions. “Today, our economic cooperation amounts to $12 billion a year, and we can easily increase this to $20 billion in the coming years,” Rouhani said at the airport before leaving Iran. 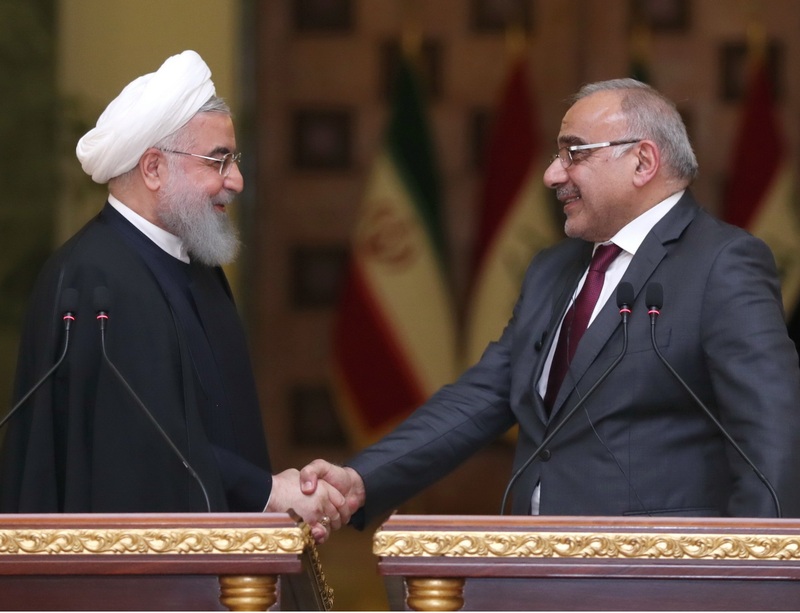 “The message of this visit is that no bureaucracy and third country can affect the amicable, brotherly relations between Iran and Iraq,” Rouhani told his Iraqi counterpart, Barham Salih, in one of his first meetings in Baghdad. Rouhani was referring to the United States, which wants Iraq to buy less goods, electricity and gas from Iran. “At the time when the United States is seeking to pressurize the Iranian nation with its unjust sanctions, we need to develop and deepen our relations to stand against them,” Rouhani told Iraqi political leaders. On his first day in Iraq, however, officials signed several preliminary trade pacts on oil, trade, health, and a railway to link the southern city of Basra with the Iranian border town of Shalamcheh. On March 12, Rouhani spoke at an economic trade forum focused on bilateral ties. He noted that the governments had agreed to issue visas for each country’s citizens free of charge. “The Iranian side praised Iraq’s decision that it would not be part of the sanctions against them,” said Iraqi Prime Minister Adel Abdul Mahdi. Rouhani traveled to Karbala to speak with local leaders and visit the shrines of Imam Hussein and Abbas ibn Ali in Karbala. U.S. officials simultaneously painted a different picture of Iranian involvement in Iraq. On March 12, Secretary of State Mike Pompeo accused Tehran of using its energy exports to “exert undue influence” across the Middle East, especially in Iraq. “While the United States is working to develop an independent, sovereign Iraq, Iran is using its energy to create a vassal state,” he said. In an interview with Alhurra TV, U.S. Special Representative for Iran Brian Hook went further. “I think what Iran would ultimately like to see happen is Iraq turn into a province of Iran so that they can create a military highway across the northern Middle East that the Iran Revolutionary Guard Corps can use to ferry missiles and weapons,” he said. “The Iranian regime wants to replace a national identity. They want to dissolve it and replace it with a Shi'ite identity. This has been the core of their foreign policy to create sectarian divisions. They want to do that in Iraq, as well,” he claimed. 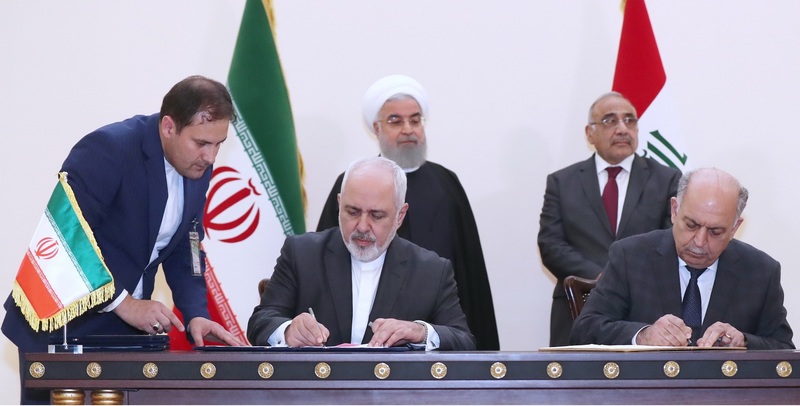 In a meeting with Iraqi elites, Rouhani claimed Western powers, including the United States, were responsible for sponsoring ISIS and moving terrorists across Central Asia. He denied the role of the United States and European countries in the fight against ISIS. “We did not let hegemonic powers introduce themselves as the savior of the region, and today, everyone knows that these Western powers did not have any role in the elimination of terrorists from the region,” he said on March 12. Hardliners have criticized Rouhani’s more moderate approach on foreign policy, but the successful Iraq trip may be used by supporters to argue that he is effective. Rouhani received tangible assurances that Iraq will not comply with U.S. sanctions on Iran and was also warmly welcomed by a wide range of Iraqi leaders, including Sunnis. Ahmadinejad’s visits to Iran, in contrast, were marked by Sunni boycotts of meetings with him and harsh statements from politicians warning about Iran’s negative influence in Iraq. The following are excerpted remarks by Rouhani and Iraqi leaders from the visit. In the name of Allah the Merciful, we thank the Republic of Iraq as Government and people for the hospitality extended to the Iranian delegation during their three-day visit. We feel that Iraq is in our second homeland and the relations between the two countries and the two peoples in fact are not new. These relations go back thousands of years, as these ties are religious, cultural, historical and regional relations, not the relations we dispense with, but we must make every effort to strengthen and develop them. The talks that took place between me and His Excellency the President in fact were good and kind. In all the talks between us, I did not find any point of disagreement between us. The relations between Iran and Iraq are in fact for the benefit of the Iranian people and for the benefit of the Iraqi people. These relations are of common interest. No doubt, we are doing our utmost to strengthen and secure these relations and not leave them in all fields. We believe that there are broad areas for joint cooperation between the two countries. These fields are the fields of trade cooperation as well as investments and the establishment of joint industrial cities, border markets and bilateral tourism relations between the two countries as well as the movement of religious visitors we see and witness between us in addition to cooperation in the fields of energy, gas, electricity, petroleum, banking, technical, engineering and technical services, as well as cooperation in the fields of roads, railways and waterways such as the River Wind as well as issues related to the environment and issues and political, regional and international issues. We in the two countries in fact over the past years have faced many difficulties and many problems as a result of the terrorism that was present and the Iraqi people and the Iranian people in fact had suffered from this evil phenomenon and we were by the side of the Iraqi people and we were by the side of the Iraqi army during the difficult days that were in this country. We are pleased by our standing by your side. 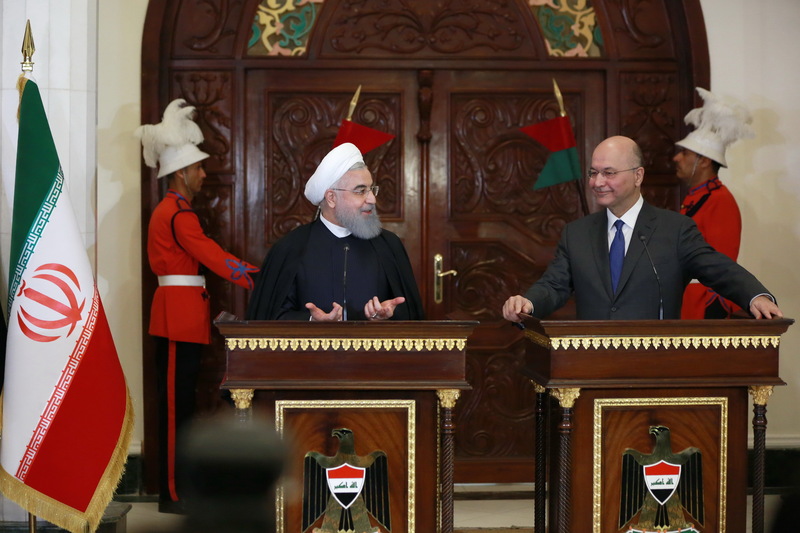 We regard Iraq as an important country in the region. We consider Iraq an Islamic state and an Arab state. This country can actually play a greater role in providing security and in establishing closer relations with the countries of this region. We want to be with Iraq to be by the side of Iraq and to be united with Iraq, not against others, of course, but we want to provide the ground to receive others and be with us. What we are concerned about is the stability of Iraq, the security of Iraq and the democracy we see in Iraq. We know that a secure Iraq, an independent Iraq will in fact have a major role in providing security and stability in this region. Finally, I would like to say something, and I would like to say again in other places. I would like to extend my sincere thanks and gratitude to the Iraqi people, especially the generous hospitality that they held and are holding for the Iranian visitors, especially in the days of Arbaeenia of Imam Hussein, peace be upon him. We attach great importance to this visit. By the way, we would like to thank His Excellency the President. We hope that these relations will develop, God willing, day by day in various fields and that relations between us and the Iraqi people will grow. Thank you. It is my pleasure to welcome the President of the Islamic Republic of Iran, Sheikh Hassan Rouhani, at the Assalam Palace in Baghdad. This visit comes to emphasize the importance of relations between our two countries and two our peoples. These relations are well established in history. They are socio-cultural relations and common security, political and economic interests. These relations are on the benefit the two countries and the benefit both peoples but they are also on the benefit the region as a whole. We spoke with the President about the importance of proper building for the strengthening of these relations by emphasizing economic ties, enhancing trade between the two countries, and also establishing the an interdependent economic infrastructure of our two countries and peoples that also extends to the entire region from railway linking, and joint industrial zones as well as lifting the obstacles and impediments to religious tourist between the two peoples. It is a fact that we conclude discussions on small vocabulary and go into the widest space in this relation. This is what is required for our two peoples and this is what is needed for the region as a whole. It was also an important opportunity for me to assure His Excellency the President, the dear guest, of Iraq's thanks to our brothers in the Islamic Republic of Iran, notably for their role in the fight against terrorism, and in the victory achieved in Iraq against ISIS, which is a victory of an important and significant, but it is incomplete. The eradication of deviant ideology and the eradication of extremism require further sustained regional effort and cooperation. This context emphasizes that our common security between us and Iran, between us and the countries of the region, require further cooperation in order to counter the reemergence of terrorism again in our country and in our region and this requires that the countries of the region cooperate in this matter and see that Baghdad is the meeting place for the countries of the region in order to reach an understanding and cooperate with each other for common interests, first and foremost to address the deviant thought, this terrorist ideology, and these terrorist organizations, but also to create a system of common economic interests among the peoples of this region, where these conflicts and rivalries that have affected the region finish out. Iraq is living an important historical turning historical moments; our country has suffered a lot as a result of regional and international conflicts that took place in the Iraqi arena. I am optimistic that the countries of the region understand the importance of stability in Iraq and the importance of supporting the process of stability in it, and that Iraq to be an arena for the convergence of interests amongst the peoples and countries of the region. I have told the President that there are those who say that the geographical location of Iraq is difficult and has many challenges and problems but on the other hand lucky by its Islamic neighborhood, with our neighbors in Iran, and Iraq is lucky by our neighbors in Turkey and lucky in its Arab extension. This depth of the Arab may and perhaps make Iraq as a factor of reunification of the region based on respect of interests of the peoples of the region and the emphasis on commonality between us of concepts and mutual values . It is time for this region to start what is required of the reconstruction and economic prosperity. The visit of His Excellency President Rouhani is an important one to us as we are having him as a dear guest. We wish him a pleasant stay. We hope that his meetings with the Prime Minister and the Government will conclude to important agreements and understandings that strengthen these bilateral relations between our two countries and peoples. There are contexts that have been agreed upon and will be announced today, all of which are in the interest of serving the two peoples and the two countries and also serve regional stability, and this is what we expect from this visit for the two peoples and the region. Welcome again President Rouhani Welcome.